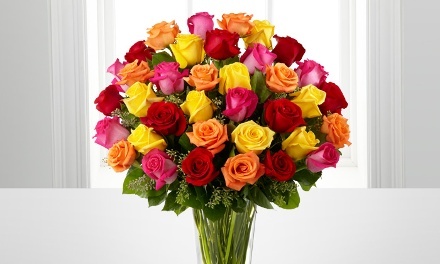 Celebrate life’s most important sentiments with FTD, offering same-day delivery in most areas for orders placed before 2 p.m. in the recipient’s time zone. Service and shipping fees apply to each order, typically ranging from $16.99 to $29.99 but varying based on the order’s contents and delivery date. All orders are backed with FTD’s Good As Gold 7-day satisfaction guarantee. Click here for additional information about redeeming your Groupon. May buy multiple. Limit 1 per order. Online only for items on FTD.com/groupon. US delivery only; not valid for delivery in AK/HI. Shipping & service fees may apply (typically $16.99-$29.99). Valid toward taxes & fees, special offers & discounts shown on FTD.com/groupon at time of redemption. Not valid for FTD email offers or websites with special offers like points/miles. Click here for complete terms & conditions.